The journey of my life... So far. Welcome to my website. I'm Sunshine. author, blogger, and Youtuber. I am the author of Kill the DJ, and the novelette, Beauty's Only Skin Deep. This is my website slash blog. This is where you can find out news about my writing, but also have a look into my life. But first, let me tell you a little about myself. I was born and raised in Vegas. There's not a lot to do in Vegas when you're under twenty-one, so I've spent most of my life finding ways to entertain myself. The two main ways have been reading and writing. When I was two years old I told my mom that I wanted to learn to read. She bought me Hooked on Phonics, and I fell in love with reading. I don't remember when I started writing stories, but it must have been at a young age. In kindergarten, I was telling my friends stories at recess. My teacher told my mom that I was a gifted writer, so my mom started signing me up for writing classes. I continued reading and writing. When I was in fourth or fifth grade I started writing what Tina Belcher would call "friend fiction". It wasn't "freaky", but it was about my friends and I going on all kinds of adventures. I worked on it for two years, before moving onto stories where I created my own characters. When I was a freshman in high school I discovered websites online where you could post your stories. I was instantly hooked. 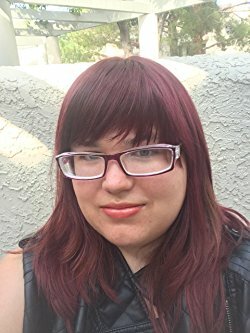 I discovered fanfictions, which I thought was great writing practice. I posted a lot of fanfictions, along with a few original stories. During the spring of my freshman year, I read The Outsiders by S.E. Hinton. When I found out that she had written the story when she was sixteen, I thought to myself, "I could do that." The problem was, I didn't have an idea good enough for a full-length story. I spent months trying to come up with one good idea, and in August that year, I found my inspiration. I was listening to the Green Day song Kill the DJ, and began wondering why someone would want to kill a DJ. Then I saw someone on twitter jokingly say that the government uses pop music to brainwash people. And my book, Kill the DJ, was born. It took me three and a half years to write Kill the DJ. In that time I battled depression (which was my main obstacle in finishing the book), I was diagnosed with PCOS and Hashimoto's disease, I graduated high school two years early, and graduated college with a degree in medical coding. I also studied physical therapy and mental health in college, but none of this was what I wanted to do, despite the very secure future I would have. On February 28th in 2017, I published Kill the DJ. It was an amazing feeling. Something I worked so hard on was out in the world. In the summer of 2017, I decided to publish a novelette I had written the summer before. So i published Beauty's only skin deep, a novelette about a group of girls who join a beauty cult. In 2018, I have re-released Kill the DJ and Beauty's Only Skin Deep. I released Election Year 2050. I have plans for a few more books in 2018 under the Name Sunshine G. Bruno, as well as books under the pen names Violet rosemary jones and chloe lambert. I am working around the clock to release books, and i can't wait for everyone to see what i have in store!